Baxter has been a front-runner in the treatment and management of end-stage kidney disease for over 85 years. Working with Baxter means having a dedicated partner that understands the challenges you face. Our state-of-the-art solutions for both hemodialysis and peritoneal dialysis are designed to transform global renal care and help healthcare professionals meet the individual needs of their patients as they sequence through their treatment journey. Peritoneal Dialysis - combined with Remote Patient Management - offers renal patients the potential to improve clinical outcomes and increase lifestyle flexibility. Hemodialysis is the predominant therapy for end-stage kidney disease patients, and can be delivered through multiple therapy options. Innovative Expanded Hemodialysis (HDx) therapy is the next evolution in hemodialysis treatment. 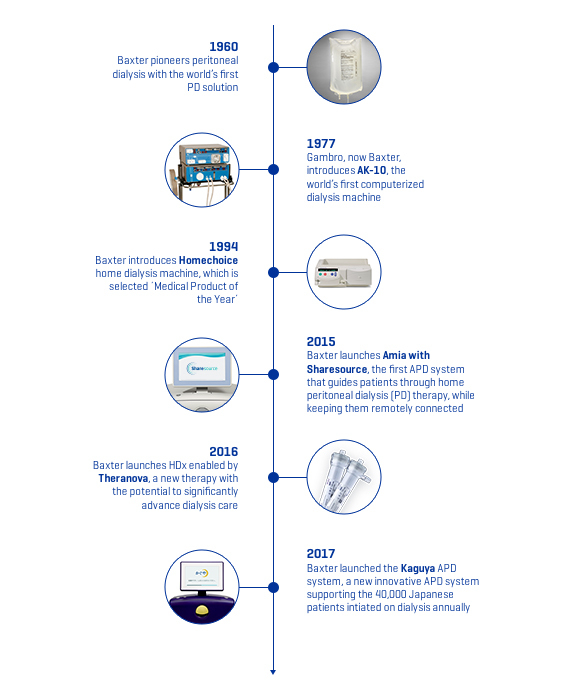 For more than 85 years, Baxter has supported renal patients and their healthcare providers by inventing solutions that improve outcomes across the continuum of care. In a continued effort to bring renal care to its next horizon, Baxter has championed innovation in both peritoneal dialysis and hemodialysis - most recently with Expanded Hemodialysis (HDx) therapy and remote patient management. At Baxter, we strive not only to improve the quality of life of current end-stage patients, but also to facilitate easier and earlier access to treatment for future patients. 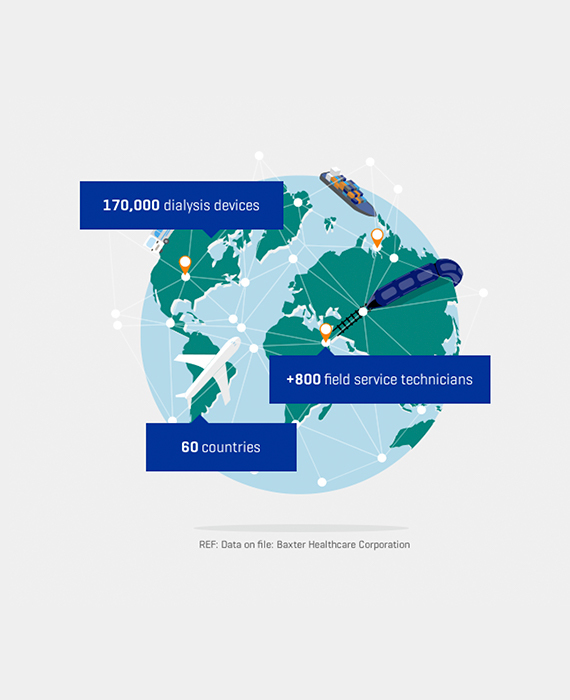 At Baxter, we pride ourselves on being a reliable and trustworthy partner to healthcare providers across the globe, supporting you in delivering high quality care to your patients. With worldwide service and support set-ups, we are there for you whenever needed, ready to help you achieve clinical excellence. Our global footprint allows us to share best practices and facilitate knowledge sharing from one region to another.